of time before mobile Internet use eclipses desktop use. What does this trend mean for operators of public access Internet venues, such as libraries, telecenters, and cybercafés? Do people who have mobile access use public access venues? Are public access venues even needed? 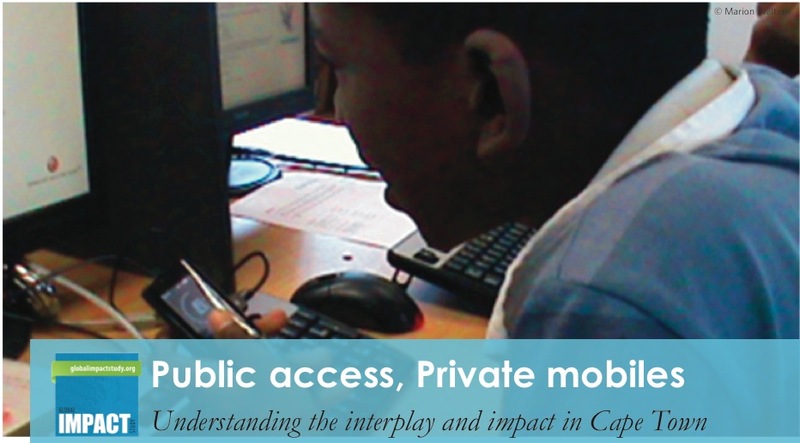 This brief summarizes Public Access, Private Mobiles: Understanding the interplay and impact in Cape Town by Marion Walton of the University of Cape Town and Jonathan Donner of Microsoft Research India on Internet use by older teens in low-income Cape Town neighborhoods for educational, cultural, health, and civic purposes. It is one of seven in-depth inquiries in the Global Impact Study of Public Access to Information & Communication Technologies. Findings point to a role for public access venues, even among a population of mobile Internet users. Public access and private mobiles offer different affordances. Among low-income users, free use (such as that in a library) supports more resource-intensive goals (storage space, time, bandwidth) and stable media production while paid use (such as a phone) supports time-sensitive goals, various forms of interpersonal communication and low bandwidth media use. Teenage users have developed complex, fine-grained practices to deal with strengths and weaknesses of public access and private mobiles. These include practices that help minimize costs, maximize convenience, and display a keen sense of which affordances or use settings will be more productive to reach given goals. Users are more likely to search for jobs or create their resumes at a venue, while mobiles are used more for keeping in touch with friends. Public access supports development of digital literacies associated with hyperlinked media and large-format documents; mobile access supports everyday social literacies and messaging. Public access supports interests and literacies associated with document production and hyperlinked media, which involves more extensive use and entails significant expenditure. Mobile access supports everyday social literacies, which require responsiveness and frequency of use, and ‘delinked’ media use. Teens can combine mobile and public access Internet resources to participate in networked media production and grassroots economic mobilization. Some students combined public access venue computer resources, non- digital resources (such as teachers, friends, and family), and mobile resources to accomplish school tasks. Students who displayed these behaviors were more likely to be the ones who attended better-resourced schools outside their neighborhoods. In other words, better-off students tended to combine resources in productive ways; there was not evidence of lower-income students ‘closing a divide’ or compensating for the lack of digital resources via their mobile Internet connections. Consider increased Wi-Fi in libraries.Low cost is part of the appeal of the library. Providing Wi-Fi might allow users to take advantage of their mobiles while waiting for machines. Free or subsidized Wi-Fi also has cost implications, so provisions need to be in place to fund the cost of bandwidth. Loosen access rules to support youth activities. Venue rules are the number one factor preventing more complementary use of mobile Internet and shared access PCs. Nine of 11 cybercafés had no rules for cell phone use. By contrast, six libraries banned mobiles, eight required phones to be silent, and four specified that phones were not to be connected to the PCs. Young people learn through play and find refuge and new identities in fantasy. Given poor quality schooling and limited employment opportunities, social networks may turn out to be crucial to future success or survival. Free public access can (continue to) support activities such as games, media production and distribution, and social networking. Some access rules may be adapted and appropriate spaces provided for online social interaction and play as well as individual work. 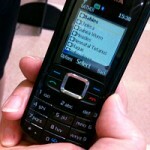 Programs can teach how to use mobiles and computers in complementary ways to achieve common goals, cost-savings, accessing cloud-based storage, curating collections of mobile-accessible resources for leisure and school, and hosting discussions about managing time, contacts, online reputation, and attention. Investigate Bluetooth and other technologies. Some technical innovations may also help break the computer bottleneck in free venues. Supporting Bluetooth transfer directly to phones, USB cables, updated antivirus programs, interfaces to larger screens or keyboards, and mobile booking, payment, printing and web publishing interfaces could be investigated. Provide training to support complementary use. Librarians and other venue operators may benefit from training to reorient towards the opportunities presented by the mobile Internet. They need willingness to help venue users get the most out of both the private and public Internets in their repertoires. 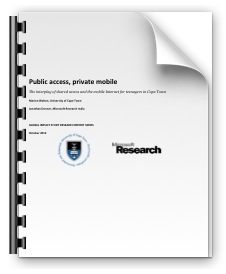 Read the full report here: Public Access, Private Mobiles. 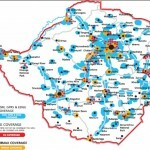 €650m SKA programme enters key development and design phase Where Are the B2B Plays in African ICT Start-Ups?